If you are familiar with the work of CCIM you will have noticed that we go about ministry in a fairly unique way: we expect to be hosted by those we travel to and minister alongside. At first glance this seems to be disproportionate to the economic realities of west meeting east. How does one coming from one of the most affluent countries in the world get off on asking those in the poorest countries in the world to host her? Well, it’s taken some time and the Lord’s heavy hand upon us at CCIM, but we are now convinced and thoroughly convicted that this is how the Lord would have us move. Let me try to explain. My first exposure to the unique economic working of the Lord came as I was staying with Edith in Uganda back in 2011. Having breakfast on her front porch one day, she pointed out to me the verse in Matthew 10:41a, “He who receives a prophet in the name of a prophet shall receive a prophet’s reward.” Edith understood that keeping me in her home was a gift back unto the Lord and one that would be honoured in the big scheme of things. On my part, I find this verse stunning, partly because I know the work it has taken in my own heart and soul and life to get to where I am today. The journey has been long years of grinding, often heart-wrenching faithfulness, deep transformation to the core of me, utter brokenness by which the Lord now pours through, and staggering risks to continue going forward. And Edith, because she gives me a place to sleep and food to sustain me, will receive the same reward as I; I feel God’s pleasure every day and Edith gets in on this. What is so interesting is that I have seen this bounty of God come to both Edith and to Mama Bosa, both of whom I’ve stayed with numerous times when I am in Uganda. My first time at Edith’s home there was a spirit of deep sadness and a certain darkness, so much so that after my first night there I told the Lord that I wasn’t so sure I should be there. To which he replied, “I want you to stay here so that the blessing you bring might rest on this home.” And so I stayed and have been back again, and each time I am there I witness the continued fresh breath of the Spirit over her home. The sadness is no longer there and a sense of God’s bounty has been inhabiting and showing itself in tangible ways. At Mama Bosa’s it has been the same. Each time I am there new developments are taking place. The cookhouse now has an addition, the rooms in her home now have doors on them, a small banana plantation has been established in the back. Tangible evidence of God’s provision and grace and, from what Matthew says, reward for keeping the prophet. Of course, coming full circle to an expectation of being kept, has taken time. My first trips I was paying a little bit each day and with everyone I was with, so as to help them with the burden of my being there. But as this went on I had a nagging sense in my spirit that by paying for my keep that I was robbing from them. I did not understand this at all at the time, but I could not get away from this thought. Of course, it seems offensive in so many ways to even be thinking this. I’m robbing from them as I help with my keep? But yes, this is the conclusion we’ve come to at CCIM, and it is due to the nature of the Kingdom of God and the way economics work when we are in the Lord’s work. “Simple concept with big implications: In small groups, money corrupts. In environments that are built on personal interaction and trust among intimates, transactions based on money don’t increase efficacy, they degrade it. At the other end of the scale, in transactions between strangers, cash scales. Cash enables us to interact with people we don’t know and probably won’t see again. Of course CCIM is all built on personal interaction and trust among intimates. We are not a top-heavy organization decreeing that we have all the answers and ‘come to us’ – rather, we are small and intent on working alongside and with pastors in their settings. We are not ministering to them so much as we are ministering with them. Every time I am on the ground overseas, my ‘team’ are those I am with at any given time. I come vulnerable to their care and oversight of the work at hand. I do my part, but much of the work, the logistics and schedule and where we go, is in fact theirs to carry. I bring the part I bring, they bring the part they bring, and through this rich collaboration the Lord pours through. Bringing money to this process would make it a financial transaction, which always closes down relationships and does not open them up. Consider how transactions work. You have a product or service, I receive this product or service, I pay you for what I receive, and upon payment our interaction is over. In the Kingdom of God, and in any artistry type work, we want to build ongoing relationships, not establish transactions. It is a subtle yet profound distinction and it takes some time to wrap our mind around. We are so used to thinking of life in terms of transactions that we hardly have a grid by which to understand work that is a product of relationships. Yet this is what God has been teaching us at CCIM and we have been working to respond and get in line, so to speak, with God’s way of doing things. It is this, consider, for example, the faith it took for Elijah to come under the care of the widow. Imagine the faith it took for Elijah to come under the care of the widow. The context is of course that widows around the world are the most crippled in terms of economic prosperity. To become a widow in ancient times, and still today in many places around the world, was a death sentence; the provision by the man of the house was paramount to her survival. And yet in 1 Kings we find God telling Elijah to go and be fed by the widow. Everything in him must have been wondering if he was hearing right. In this we get a glimpse of the way of the Kingdom of God which is beyond our understanding and outside our common sense. This picture is of Pastor Timothy in India. Here he is feeding the widow as is right and good and the way our knowledge of God works and of which we are indeed commanded many times in scripture. But imagine yet, that God were to tell him to be cared for by this widow and to enter into a vulnerability by which she becomes his benefactor. An offence in any normal sense of understanding and yet vital to the work of the Kingdom of God that we enter into vulnerability and into relationships by which the touch of God is free to flow and not inhibited by our spoiling of Him via human transactions. And so we offer no money for our keep, we pay no one to feed us, and all the money we do bring becomes team money for the internal travel on the ground; we use money to get us to more people, but once there we enter into kingdom life and mutual vulnerability and receiving (key is receiving, not taking! – never assuming that people want us to come) from one another as the body of Christ. At CCIM we are committed to not degrading the work of the Lord. The intended result of our times alongside pastors and leaders around the world are for the purpose of God’s mighty hand and touch upon their congregations and communities. It is not ours to bring economic relief (by our hand), it is ours to enter in the Lord’s solutions, the Lord’s freedoms, the Lord’s provision. A pastor that I follow in Uganda has been chronicling a story of a family he knows. Their young son had died at the same time that there was a prophetic conference in town. They brought their dead son to the conference where he was prayed for and became alive once more. And since their son was brought back to life they have had unprecedented abundance realized in all parts of their life; they have a new house, amongst other things. To observe this work of God, how the touch of our Lord creates transformation in every area of our life, has opened up my own thinking and understanding of God and His expansive intent over our lives. He knew, for instance, that as the widow risked to feed Elijah that her future was secured. Our own thinking must become this big for only as we align ourselves to the bigness of God do we enter in His Kingdom on this earth. But to have this work of the Lord realized it must not be compromised by my own human desire to fix things by my own short term financial gifts, and that to do so would in fact counteract the very work that God intends to accomplish. As a result and as we come alongside indigenous pastors I am on the outlook and wary of those who do not yet understand the way economics work in the Kingdom of God. 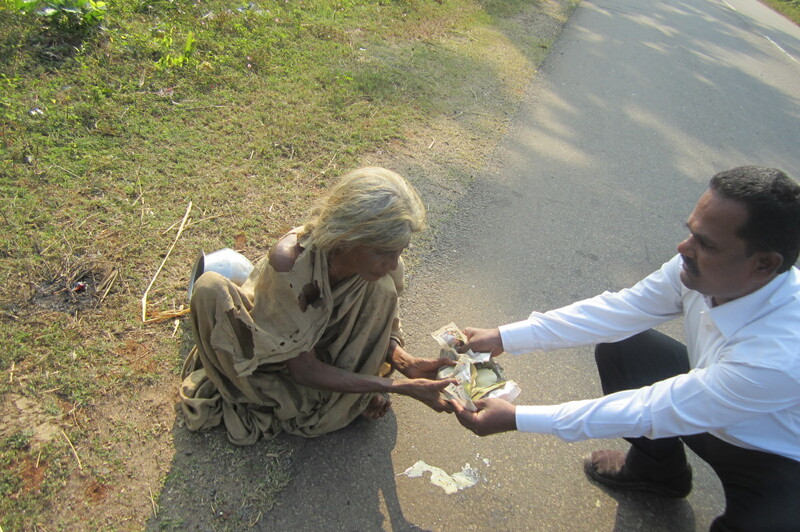 Those who continue to use their poverty to plead for assistance indicates to me a still-human way of thinking. I am not so likely to come alongside those who are not yet able to see the co-partnership required in God’s work that is outside of economic realities; when leaders in the Kingdom of God plead poverty as reason to minister to them I know that something is wrong in their thinking and understanding of God and His ways. The Kingdom of Heaven has not yet broken into their understanding. I speak not just as a theorist but as a practitioner. In my own journey I have experienced poverty. I know what it is to have literally no food in the house, to be starving myself so that my children can eat, to be dependant on others to donate clothes for my children to wear, and I’ve know the true poverty of hopelessness and despair and seeing no way forward. And in this I’ve known what God asked of me, to trust Him going forward, to give out of my little, to move ahead in generosity with what I had, to go one day at a time, and to risk beyond my means. Only in this way, does the Kingdom of God begin to break in upon us and transform our realities. Only as we give out of our little, allowing God to make it into much, do we find the tenor of our days changing with provision that is beyond us becoming ours. It doesn’t make sense but it is of God. So, at CCIM we give out nothing from our own best sense. In fact, we come in under the care and provision of others. We know, that as we do this, that the Kingdom of Heaven breaks in upon all of our realities, that as we engage vulnerability together that God is realized in all His bigness and glory and touch. Come Lord Jesus Come. This entry was posted in Capturing Courage Daily and tagged kingdom of God, sufficiency in the lord, vulnerability in him and each other. Bookmark the permalink.